Samford University Provost and Executive Vice President J. Bradley Creed has been elected to a four-year term on the National Board of the Lilly Fellows Program in Humanities and the Arts. 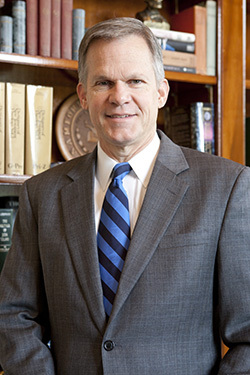 At Samford since 2001, where he is also Professor of Religion, Dr. Creed served as Professor of Christian History, Associate Dean and Dean at George W. Truett Theological Seminary of Baylor University from 1993 - 2001. He is also the former pastor of the First Baptist Church of Natchitoches, La., and has previously served as a youth minister, church planter and interim pastor of churches in Texas, Oregon, Oklahoma, Virginia and Alabama. He holds the B.A. degree from Baylor and M. Div. and Ph.D. degrees from Southwestern Baptist Theological Seminary. Creed serves on the Board of Directors of the International Association of Baptist Colleges and Universities, the Alabama Historical Association and is a member of the Academic Task Force for the Council of Independent Colleges and Universities. Founded in 1991, the Lilly Fellows Program in Humanities and the Arts seeks to strengthen the quality and shape the character of church-related institutions of learning through three programmatic initiatives. First, it offers postdoctoral teaching fellowships for young scholars who wish to prepare for positions of teaching, scholarship and leadership within church-related institutions. Second, it supports young men and women of exceptional academic talent who are exploring vocations in church-related higher education during their first three years of graduate school in the Lilly Graduate Fellows Program. Third, it maintains a collaborative National Network of Church-Related Colleges and Universities that sponsors a variety of activities and publications designed to explore the Christian character of the academic vocation and to strengthen the religious nature of church-related institutions. The National Network represents among its current membership of 100 schools a diversity of denominational traditions, institutional types and geographical locations. Samford has been a member of the Lilly Fellows Program National Network since 1992 and hosted the annual National Conference of the Lilly Fellows Program in 2011. The Lilly Fellows Program is based at Valparaiso University's Christ College, the university's interdisciplinary honors college.